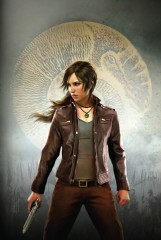 Lara Croft wants only to put her horrifying ordeal on Yamatai island behind her. Her modest wish shatters as she's plunged into a frantic race to save her best friend Sam from a toxic overdose. Desperate for a remedy, Lara searches for anything that could help Sam. A wisp of hope arising from a myth gives Lara purpose: the story of an ancient and mysterious artifact that could heal her dying friend, and possibly help explain the supernatural events she witnessed on Yamatai.